Bicycle people usually carry any tool kit either under the seat, (in its own mini-pannier) , or packed in with their other luggage. However , my "de luxe" tool kit, including crank extractor, adjustable spanner, cone spanners, small pliers, spare cables, screws etc weighs in at about 800 g. This is too much for a wedge pack, which is designed for a spare tube and/or a tiny tool kit, and is really suitable for day trips - but not much else. Besides, using the under-the-seat position raises the bike's centre of gravity, not good for handling. 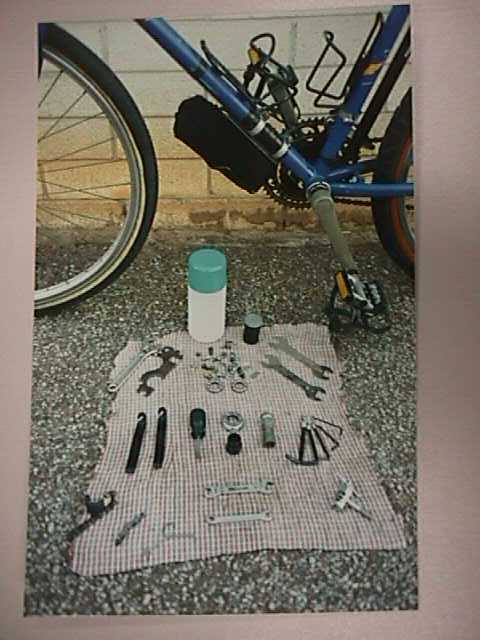 Alternatively, if you carry the tool kit in your panniers, you face the problem of maintaining balance between the two sides of the bike for the sake of your bike's handling. You will also want to carry the tool kit in the bottom of the panniers, (otherwise, it would crush anything placed below it !) but then you may need to pull everything out to get at the tools when you need them - and this can be inconvenient , especially in rain or mud ! As well, even the best panniers have a certain amount of sway, and the weight of the tool kit moving with the panniers does nothing good for the panniers themselves, or for your rack mountings. And even the best-kept tool kit will be greasy sometimes, not the sort of thing to pack with your clothes or food, if possible. So, all in all, carrying tools in your panniers presents a few problems. The answer ? Our solution is to mount a bottle cage in the "third " position, on the underside of the down tube. Better bikes will have bosses, but you can easily find clamps to fit. Set up loosely at first to check for clearances with the front wheel. Then, find a 75 mm diameter plastic bottle ( a very common standard size which will always fit the cage.) Find a second similar one for a top, cut with a Stanley knife to make a fully waterproof tool box - finish off with a sock the same colour as your bike for a cover if you like. The container will hold a surprising quantity of tools safely without all the hassles described above. The same tool kit will suit any occasion - except a race perhaps - regardless of what panniers you want to use at a particular time. You will find that handling is improved with the weight down low - your bike will feel like it's hugging the road, leaving you free to enjoy the scenery. Setting up camp is also easier - you can leave the tools on the bike in any weather. And you free up space in your panniers for lighter or more bulky items that you need sometimes but not always - an empty water/food container maybe ?. Try it, we're sure you'll like it !